Powers/Abilities: The Anti-Claus embodies the spirit of taking. He could cause newly received Christmas gifts to break the next day. 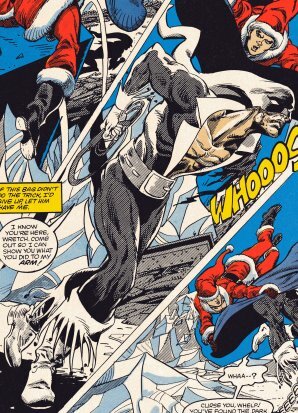 Large (he looked to be b/t 7 and 8' tall) and superhumanly strong (enhanced human), the Anti-Claus was virtually immune to pain (not even flinching from a severed limb) and highly resistant to injury (he lacked a heart and possibly other internal organs). He was allegedly immortal. 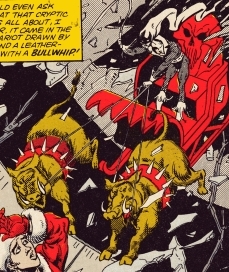 Quite bloodthirsty, he rode a sleigh-like chariot drawn by a pair of flying warthogs that he controlled with a bullwhip, which he also used as weapon. (Bizarre Adventures#34 (fb) - BTS) - The immortal enemy of Santa Claus, embodying the spirit of taking, the Anti-Claus hounded Santa for an undetermined length of time, trying to undo all the good things he'd done. (Bizarre Adventures#34 (fb) - BTS) - Engrossed in preparing for the Holiday rush, Santa was caught completely unaware by the Anti-Claus' attack. As he fought back, he sent his loyal elf Agonistes to seek out his son, Nick Norris, for aid. Before Agonistes could return, however, the Anti-Claus overpowered Santa Claus, freezing him to death and then demolishing his base. He apparently froze the rest of the elves, too. (Bizarre Adventures#34) - After Agonistes returned with Nick and shared Nick's true origins, the Anti-Claus spoke to them through a monitor screen. Sensing Nick's aura and seeing him wearing an extra Santa Claus outfit (to stay warm in the open Arctic air), he threatened Nick with death. Seconds later, the Anti-Claus' chariot burst through the roof, and the Anti-Claus attacked with his whip. Nick fled into Santa's worskshop, grabbed a screwdriver, leapt up on the counter, and stabbed a screwdriver into the Ant-Claus' chest. Lacking a heart, the Anti-Claus was unharmed and hurled Nick away. Nick threw some more things as the Anti-Claus and then ran back through the workshop where he found a precariously balanced sleigh, which he then pushed on top of the approaching Anti-Claus, severing his left arm. Unfazed, the Anti-Claus hurled the sleigh back at Nick and then attacked again with his whip. Narrowly escaping, Nick fled again until he came across a big burlap sack, which Nick soon discovered to be Santa's magic bag, with virtually unlimited space on the inside. Leaping from atop a cabinet, Nick pulled the bag over the Anti-Claus, trapping him inside, and then held top shut. Comments: Created by Mark Gruenwald and Alan Kupperberg. Note that in the large, full body picture, he's running around without his left arm, which had been severed in battle minutes before. The story and characters from the Son of Santa are � 1982 Mark Gruenwald, and the art is � Alan Kupperberg.